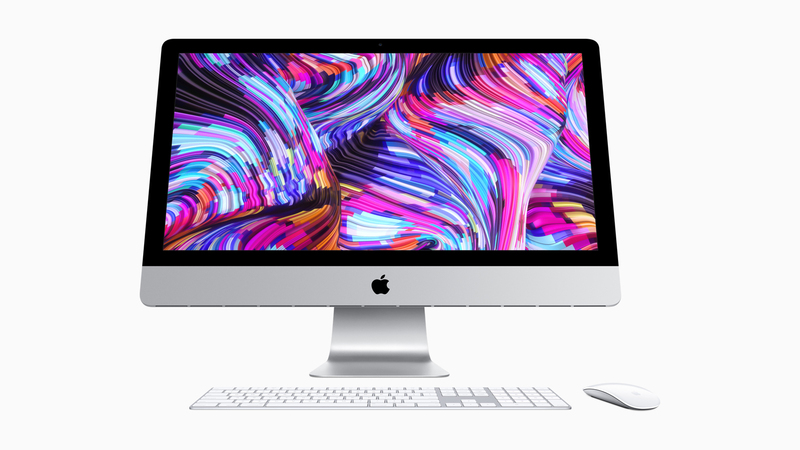 <br/>With up to 14.7 million pixels, 1 billion colors, 500 nits of brightness, P3 wide color gamut and an incredible viewing angle, iMac’s Retina display delivers an immersive front-of-screen experience. All these pixels result in text that looks like a printed page, sharper photos with more detail, and the ability to edit 4K video at full resolution. <br/>With its sleek aluminum and glass enclosure, 5 millimeter-thin profile and beautiful matching keyboard and mouse, iMac delivers a clean and uncluttered desktop experience that allows users to focus more on their content. With everything they need and nothing they don’t, customers love how iMac fits seamlessly into so many different environments, from the home, to businesses of all sizes, or even a pro studio. <br/>All new Macs come with macOS Mojave, the latest version of the world’s most advanced desktop operating system, with features inspired by pros but designed for everyone. In macOS Mojave, Dark Mode transforms the desktop with a dramatic new look that puts the focus on user content, Stacks organizes messy desktops by automatically stacking files into neat groups and FaceTime supports group calling. macOS Mojave also brings iOS apps, including News, Stocks, Voice Memos and Home to the Mac and features a redesigned Mac App Store with rich editorial content and the addition of apps from top developers, including Microsoft and Adobe. <br/>The new 21.5-inch <a href="https://www.apple.com/imac/" target="_blank">iMac</a> with Retina 4K display starts at <strong>$1,299</strong> (US) and the new 27-inch iMac with Retina 5K display starts at <strong>$1,799</strong> (US). Both are available to order starting today from <a href="https://www.apple.com/" target="_blank">apple.com</a> and the Apple Store App, and in Apple Stores and through Apple Authorized Resellers next week. The non-Retina display iMac configuration continues to be available for <strong>$1,099</strong> (US). Additional technical specifications, configure-to-order options and accessories are available online at <a href="https://apple.com/mac/" target="_blank">apple.com/mac</a>.